Pumps may still have a future in motoring, but liquids made of long dead sea creatures may not. A new project from MIT could be a significant step in overcoming one of the biggest problems with electric cars: namely, how to get around lengthy recharge times. The researchers at MIT have come up with an electricity-bearing goo, which motorists would be able to pump into their cars like gasoline. The goo is a combination of two existing technologies: lithium ion batteries, which can be found in most cell phones and other small devices, and aqueous-flow batteries which use fluids to store electricity. 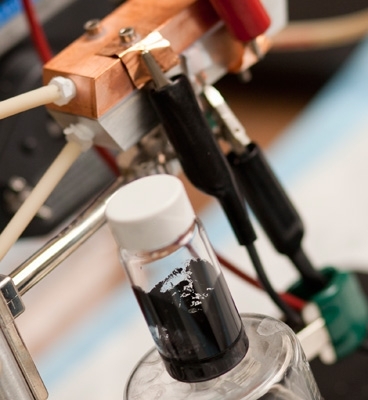 The problem with existing flow batteries is that the amount of power that they could hold was very low, but using the liquid to suspend the solid battery material in, the new technology can store a lot more power. The semi-solid flow cell, which is the technology's proper name, has a number of advantages. Firstly, pumping in new fuel would not be as time consuming as battery exchanges or recharge stations, and secondly, by removing the storage function from the battery itself, it allows the complete system to be more efficiently - and more cheaply - designed. Best of all, "Cambridge Crude" is not locked in to any particular formulation, so when a more efficient design comes along, people will be able to start using it straight away. The technology also has lots of application outside the automotive industry, as it can be cheaply scaled up, giving it a lot of potential for larger scale uses, such as making intermittent power sources like solar and wind energy more viable solutions to burning fossil fuels. It's still going to be a while before the commercial version of the technology is ready, but this could be an important step to a much cleaner future.